precipitation of small balls or pieces of ice (hailstones) with a diameter ranging from 5 to 50 millimeters (0.2 to 2.0 inches), or sometimes bigger, falling either separately or agglomerated into irregular lumps; when the diameter is less than about 5 millimeters (0.2 inch), the balls are called ice pellets. group of optical phenomena, in the form of rings, arcs, pillars or bright spots around the sun or moon, produced by the refraction or reflection of light by ice crystals suspended in the atmosphere (cirrus clouds, diamond dust, etc.). 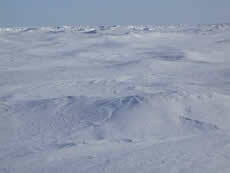 frozen ground (soil or rock) which is firmly cemented by ice. fine dust or salt particles dispersed through a portion of the atmosphere; the particles are so small that they cannot be felt or individually seen with the naked eye, but they diminish horizontal visibility and give the atmosphere a characteristic opalescent appearance that subdues all colors; a type of lithometeor. a steep cliff, usually the uppermost part of a cirque. equilibrium between the gain and loss of heat at a specific place or for a specific system. the equilibrium that exists between the radiation received by the earth and atmosphere from the sun and that emitted by the earth and atmosphere. relation between fluxes of heat into and out of a given region or body and the heat stored by the system; in general, this budget includes advective, evaporative, and other terms as well as a radiation term. the amount of heat transferred across a surface of unit area in a unit time. process, or region, in which energy is removed from the atmosphere in the form of heat. process, or region, in which energy is added to the atmosphere in the form of heat. upward pressure developed during freezing of the ground. area of high pressure in the atmosphere; used interchangeably with anticyclone. typically thin, white clouds above 6,000 meters (20,000 feet); at these altitudes, temperatures are so cold that clouds are composed primarily of ice crystals; includes cirrus, cirrocumulus and cirrostratus clouds. a deposit of interlocking ice crystals (hoar crystals) formed by direct sublimation on objects, usually those of small diameter freely exposed to the air, such as tree branches, plant stems and leaf edges, wires, poles, etc. ; the surfaces of these objects are sufficiently cooled, mostly by nocturnal radiation, to cause the direct sublimation of the water vapor contained in the ambient air. 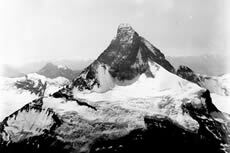 a peak or pinnacle thinned and eroded by three or more glacial cirques. from the point of view of the submariner, an ice canopy containing no large ice skylights or other features which permit a submarine to surface.